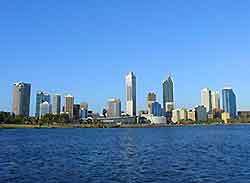 Perth is a spreading and diverse city, and the capital of Western Australia, the country's largest state. Although Perth is not as big as some of Australia's other capital cities, its smaller size and rich history make this enticing city especially appealing. Combine Perth's near perfect sunny weather with breathtaking blue rivers, stunning beaches on the world-famous Sunset Coast, many historic and sparkling new modern buildings, lush parks and world-class tourism, and it is easy to understand why this has become one of the most popular cities in Australia. Central Perth lies alongside a scenic section of the Swan River, with vibrant waterfront districts residing on the southern and eastern banks. Daily business takes place along St. George's Terrace, while for the best shopping opportunities, head to Hay Street and Murray Street. The official City of Perth Tourist Information Kiosk stands on the corner of Forrest Place and the Murray Street Mall, with the Western Australian Visitors Centre also residing in this part of the city. Many of Perth's hotels are particularly concentrated around the coastal Cottesloe and Scarborough districts. These hotels are perfect for beach and surf holidays, and many are located on the beachfront itself. The Northbridge and Subiaco areas boast some world-class hotels, and nearby, the more residential suburb of South Perth tends to be preferred by families, being connected to the city centre by Narrows Bridge or the regular ferries plying the Swan River. Other accommodation is available on the outskirts of Perth, in scenic areas such as Fremantle, Joondalup, Kalgoorlie, Malaga and Mandurah, where you will find many stylish, boutique-style guest houses. These are often more reasonably priced during the week, although weekend packages are sometimes available. Historic tourist attractions for visitors include Perth Cruises - with many boats regularly departing from Barrack Street Jetty and travelling along the spectacular Swan River; the Swan Bell Tower - built to celebrate the Millennium and now one of the most breathtaking landmarks around; His Majesty's Theatre - more than 100 years old and listed by the Australian National Trust; Perth Concert Hall - with impressive acoustics, hosting innumerable concerts, operas and musical events; Perth Town Hall - dating back to the late 1860s, when it was built by convicts; Parliament House - built in 1904 to house Western Australia's seat of government; the Perth Mint - the oldest working mint in the whole of Australia, with regular demonstrations of gold production; Saint Mary's Cathedral - dominating Victoria Square and housing the headquarters for the Catholic church; Saint George's Cathedral - one of the most distinctive buildings in the whole of Western Australia, built in the mid-19th century. Other popular attractions for tourists and visitors to Perth and the Western Australia area include whale watching tours - operating from the coastline between September and November, when the enormous humpback whales pass nearby; the Aquarium of Western Australia - one of the most popular places for children and families, with a huge 98-metre / 321-foot underwater tunnel; Perth Zoo - a spectacular zoo with many natural habits and a fantastic collection of animals from around the world; the Scitech Discovery Centre - home to more than 160 interactive, science exhibits and activities; the Kings Park and Botanic Gardens - covering more than 400 hectares / 985 acres of natural bushland and landscaped gardens; Lake Joondalup - an area of great natural beauty, full of native Aussie wildlife; Queens Gardens - one of the most outstanding landscaped gardens here; and Whiteman Park - a popular and vast recreational area with decent sports facilities. 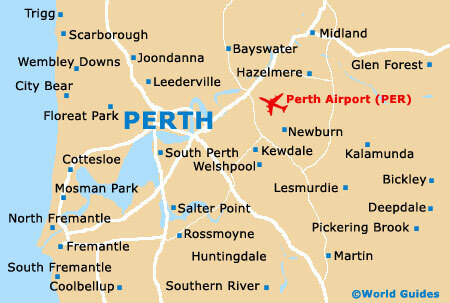 More information about Perth Tourist Attractions and Perth Landmarks. Perth also has a number of excellent museums, including the Western Australian Museum - with a large dinosaur section and related information about the Jurassic and Cretaceous periods; the Perth Museum of Childhood - dedicated to the childhood heritage of the city; the Fire Safety Education Centre and Museum (FESA) - housed in Western Australia's first fire station, which was built in 1901; the Berndt Museum of Anthropology - with enormous collections of Australian Aboriginal art and cultural artefacts; the Old Court House Law Museum - dedicated to historic items relating to the history and development of Australian law; the Art Gallery of Western Australia - in the old Police Courts, featuring more than 1,000 spectacular paintings and sculptures; and the prestigious Perth Institute of Contemporary Arts (PICA) - a superb art gallery brimming with modern paintings. Nearby Perth there are a huge number of major tourist attractions suiting excursions, such as Rottness Island - an excellent scuba diving location; Rockingham - located to the south, where you have the opportunity to snorkel and interact with friendly, wild dolphins; Mandurah; Jarrahdale; Pinjarra; the Darling Range - with Mundaring, Kalamunda and the Walyunga National Park; Fremantle - first founded by settlers in 1829, at the newly constructed Swan River Colony; York - the oldest inland town in Western Australia, full of 'Gold Rush' heritage; and the Avon Valley - with attractions such as Toodyay and York. On the north coast of Perth you will find Yanchep, Guilderton and Lancelin - which include a number of good sports for windsurfing. Perth is full of historic vineyards, wineries and breweries, and many of Western Australia's best wines are produced in the picturesque Swan Valley. Wine from this region is highly regarded around the world and the numerous vineyards here often offer courses about general wine appreciation. The University of Western Australia is located next to Matilda Bay, in the Crawley area, near to Kings Park and Fremantle. This historic educational institution was founded in 1911 and moved to its current location in the 1930s, when it became the University of Western Australia (UWA). Producing over 75,000 graduates since it was first established, the campus now covers around 65 hectares / 160 acres and is close to many important attractions, including Matilda Bay. 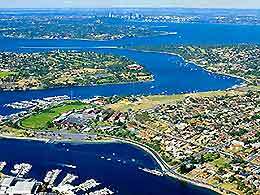 Perth, the most important city in Western Australia, is situated on a large sweep of the scenic Swan River. 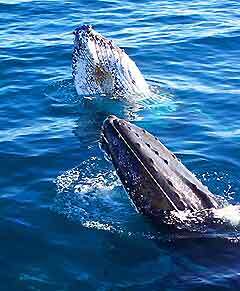 With a large port in the Fremantle district, world-class shopping, superb restaurants, stunning weather and glorious, sandy beaches, Perth is a popular destination to visit at any time of the year and understandably attracts tourists from all over the world.